"Good enough" computing has a place. But the Hi13 struggles to reach that modest bar. The Chuwi Hi13 2-in-1 tablet aspires to be a poor man’s Surface Book, with a price tag a mere fraction of Microsoft’s own. But as our Hi13 review demonstrates, it falls short in terms of performance, battery life, and even construction. 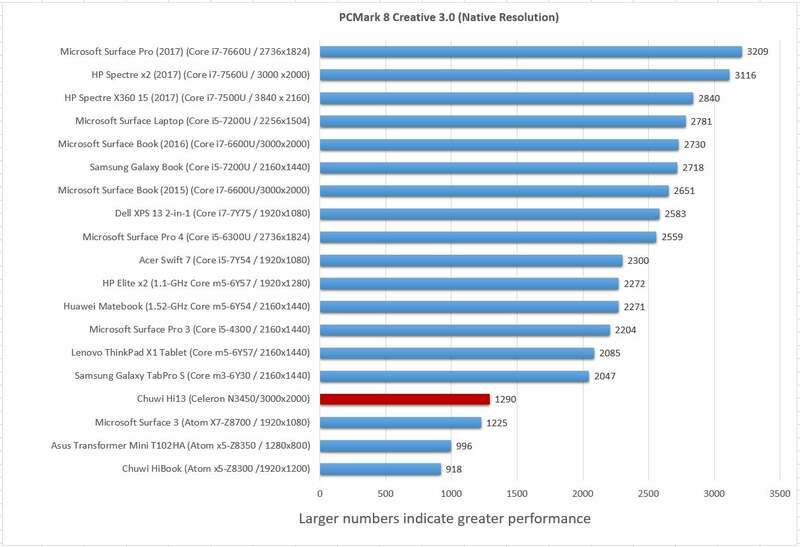 It must be said that the Hi13 performs basic computing tasks adequately: office work, web browsing, 4K video playback, and even (very) light gaming. For $400 (plus an additional $65 for the almost-obligatory keyboard base, and $35 for an optional stylus) Chuwi tries to deliver a ruggedized version of the Surface Book—there’s even a virtually identical 3,000x2,000 display. Our opinion, though, is that Chuwi would have been better off spending a tad less on the display and investing more heavily elsewhere. 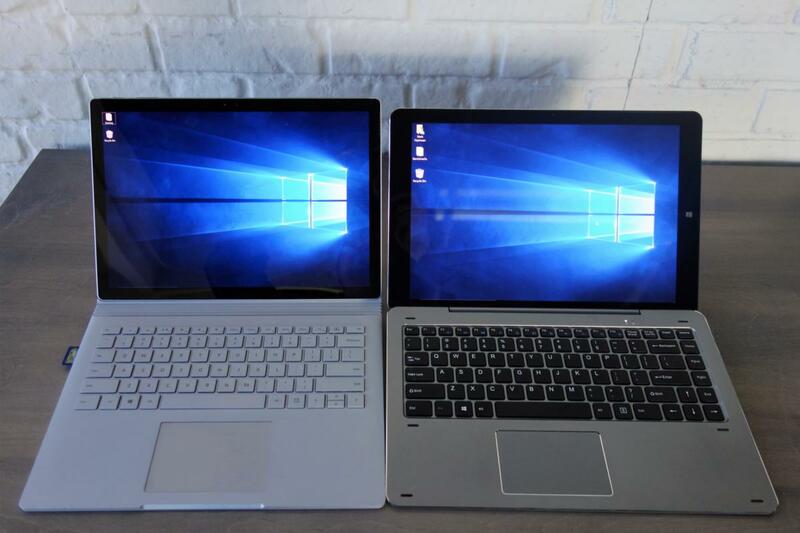 The Chuwi Hi13 (right) wants to be the budget Surface Book, but it spent its money in the wrong places. Chuwi told us its Hi13 was its version of the Surface Book , Microsoft’s 2-in-1 laptop whose price tag can reach north of $2,000. It’s an enticing proposition—if there’s any product crying out for a lower-price option, it’s the Book. While most 2-in-1s opt for some variation of Intel’s Core chips, Chuwi has tended to favor Intel’s low-cost, low-performance Atom processors. 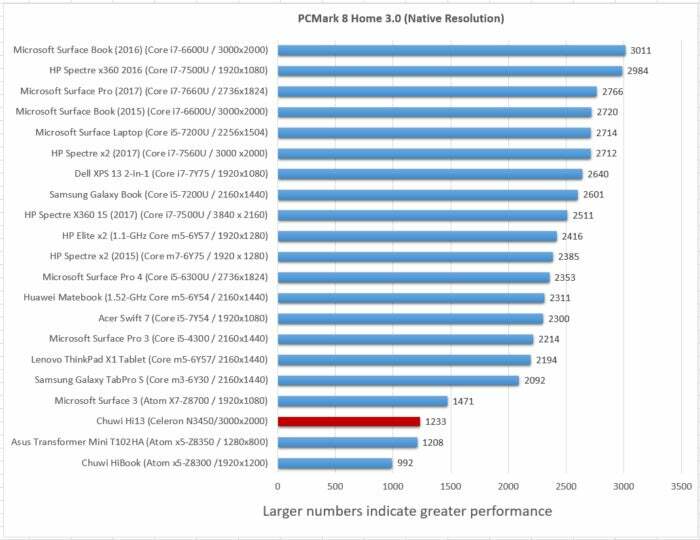 In this case, the Hi13 uses the 1.1GHz quad-core Celeron (“Apollo Lake”) N3450 that Intel launched in 2016. Buying an Atom device has usually boiled down to a simple question: Is the processor capable of handling the tasks that you need it to do? In the Hi13’s case, the answer is Yes, though it’s not especially pleasant. Chuwi places almost all of its ports on the left-hand-side of the tablet, and there’s a bunch, including mini-HDMI, micro-USB, USB-C, and a micro-SD card slot. Two speaker grilles at the top and bottom complete the package. In part, that’s because Chuwi felt obligated to keep up with premium devices like the Surface Book. The Surface Book uses a 3,000x2,000, 13.5-inch, IPS 10-point touch display—but includes Core i5 and Core i7 chips to drive it. 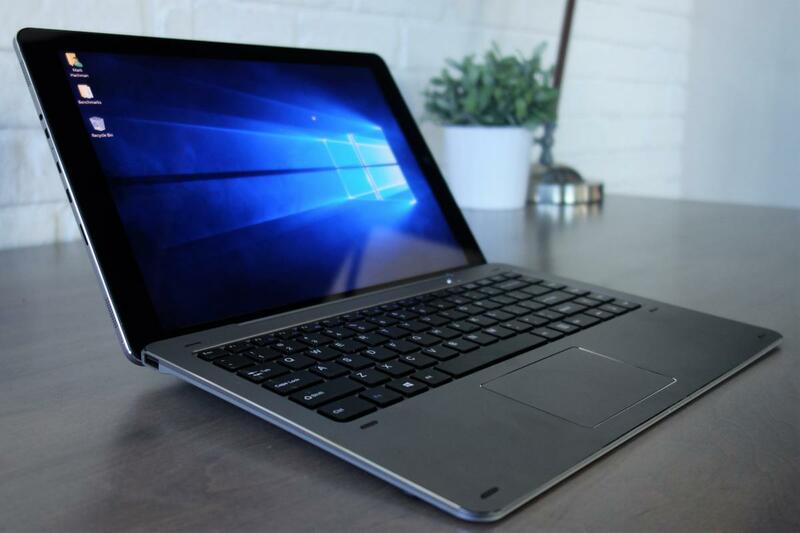 Chuwi’s Hi13 product page touts its screen as an “original Surface Book screen, but beyond that, the product skimps: There’s just 4GB of memory behind its low-end Atom processor, and 64GB of SSD storage. 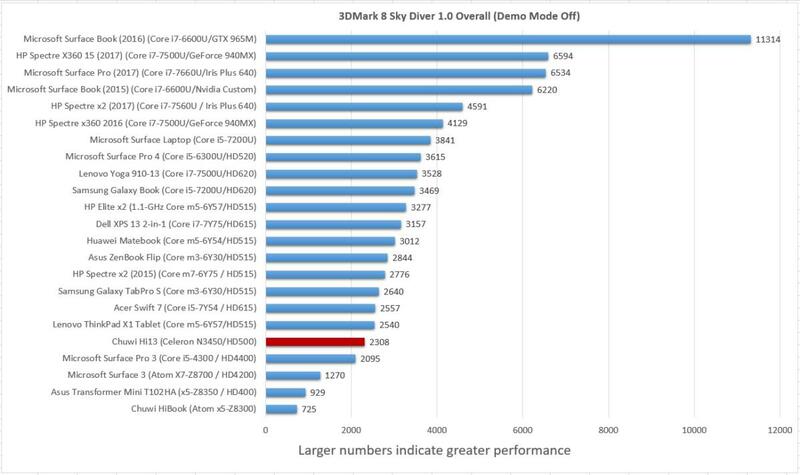 Chuwi claims that the associated HD Graphics 500 integrated GPU is enough to play some games like League of Legends (more on that later), though that’s about as far as gaming goes on the Hi13. The Hi13 uses a standard power brick to charge the tablet. 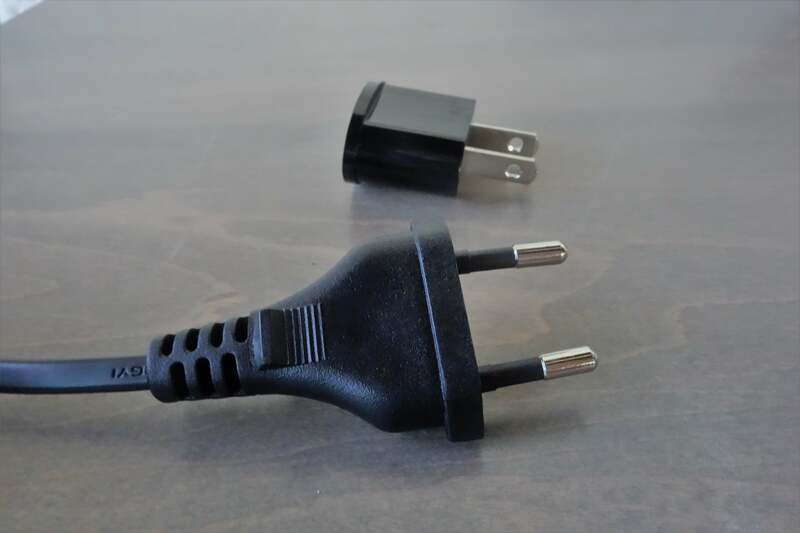 Our unit was shipped with a plug designed for the Chinese market, requiring a socket adapter. All told, the Chuwi Hi13 isn’t hurting for connectivity options. 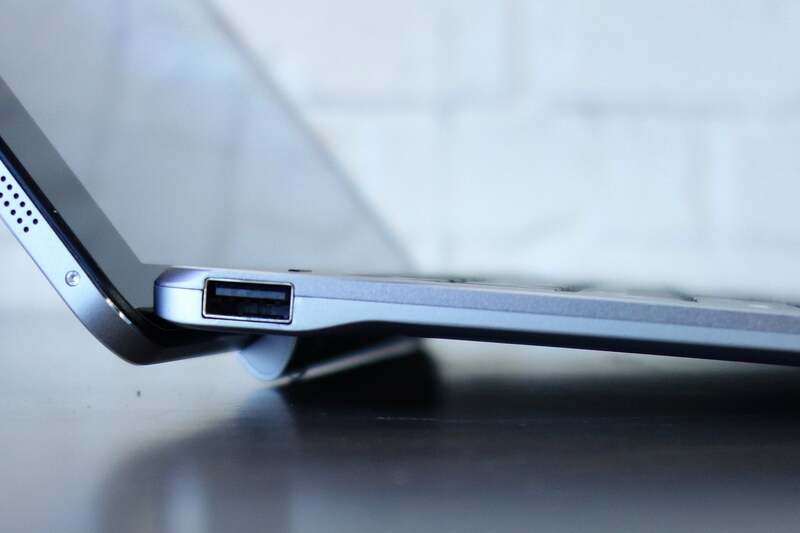 The Hi13 is one of the few tablets we’ve seen that uses USB-C charging but also includes a micro-USB port—not for charging, but for connecting mobile devices with a USB On-the-Go cable that ships with the tablet. There’s also a standard micro-HDMI slot for an external monitor, plus a headphone jack and a microSD card slot. On either side of the keyboard sits a single USB 3.0 Type C connector. Inside the tablet sits 802.11ac and Bluetooth 4.0 for connectivity. Chances are that you’ll need to tack on an additional $20 or so if your Hi13 ships with a foreign plug, as ours did. Chuwi fell short on mulrimedia. It arguably shouldn’t have bothered with the 5MP rear camera and 2MP front camera, which provide just the bare minimum for picture-taking and video chat. As for the speakers, even for a portable computer they are noticeably underpowered, with scant volume. By comparing itself to devices like the Surface Book, Chuwi can also partially defend itself as a notebook-like 2-in-1 tablet. On smaller devices like last year’s 10.1-inch Chuwi HiBook, the all-metal, unibody construction added structural rigidity. On the Hi13, it feels like hauling around a Volvo. At 4.32 pounds, it’s about three-quarters of a pound heavier than the original Surface Book, and almost double the weight of other 2-in-1 tablets. (It measures 13.1 x 8.74 x 0.36 inches). If you like to watch movies in tent mode, where the tablet and keyboard sit perched like a teepee on a desk or coffee, you should be just fine with the Hi13. Personally, though, I never looked forward to shouldering the Hi13 on my backpack or putting it on my lap. 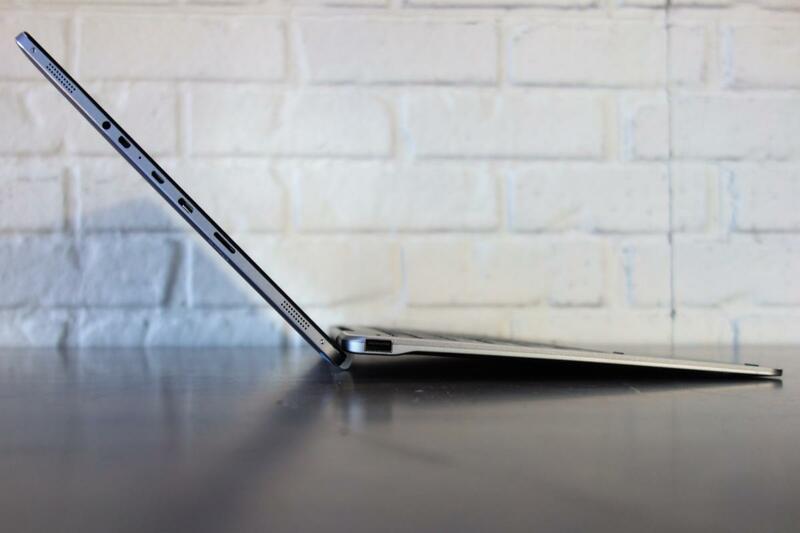 “Lapability” is a mixed bag with the Hi13. Most 2-in-1 tablets have settled upon a pair of magnetic hinges that run the length of the tablet, usually securing them to the keyboard. 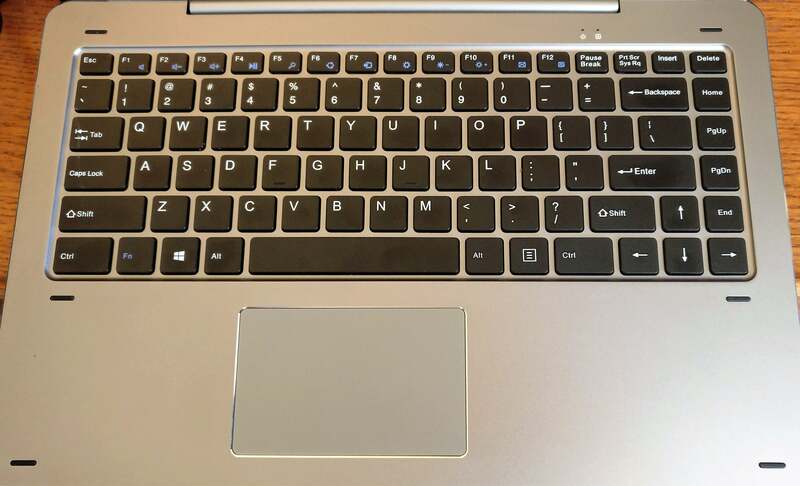 Microsoft’s Surface Book uses a pair of clamps that extend out from the keyboard base, grabbing the tablet securely and disconnecting after a user presses a special key. Chuwi has adopted its own approach, connecting the keyboard and base using two pegs. As it did with the Chuwi HiBook, it all feels extremely sturdy, and you don’t need a special key to separate the pieces. One of the Hi13’s true annoyances: a hinge that jabs your thighs. Note the USB-A slot in the keyboard; there’s one on each side. Increasing the size of the tablet to challenge the Surface Book, though, introduces some problems. For one thing, on your lap the Hi13 feels less like a Surface Book and more like a Surface Pro 4. As with the Surface Pro 4, part of the Hi13’s hinge extends a bit beyond the keyboard, unexpectedly jabbing your thighs. I give Chuwi credit for allowing the tablet to recline to 130 degrees or so, more than the 115 degrees the Surface Book achieves. But the Hi13 is also decidedly top-heavy. Recline the tablet portion too far, and —look out! !— the Hi13 will backflip off your lap, plunging like a lemming to the floor. Even fully reclined on a tabletop, the Hi13 is at risk of flipping over with a light touch upon the screen. It’s true that other laptops and 2-in-1s will also slip off, especially if you like typing with your lap slightly declined toward the floor. 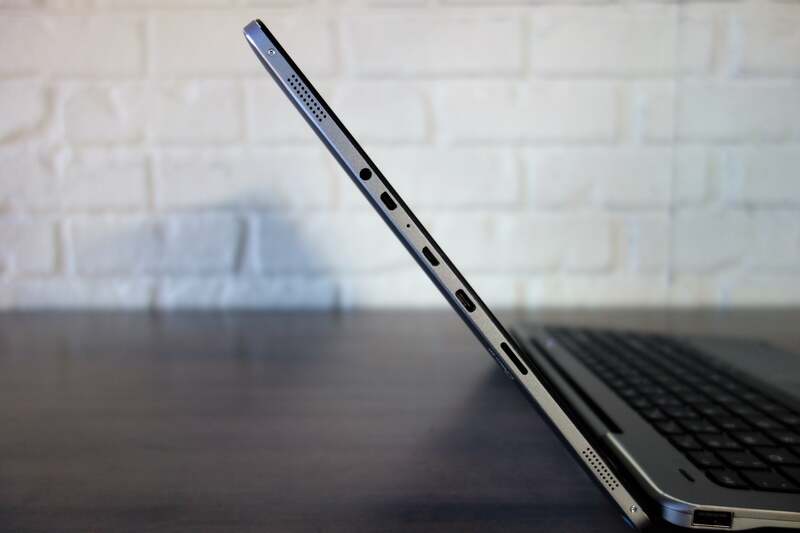 But remember that most two-in-ones are built with a kickstand to counteract the weight of the tablet, while laptops concentrate the weight inside the base. The Hi13 employs neither approach. The Hi13 at full recline. Unfortunately, a light touch will tip the whole thing back. While the Hi13’s keyboard is nothing to write home about, it employs a standard layout with large keys that provide plenty of landing space. It feels a little less firm than others I’ve tried, though, meaning that the impact feels a little less “sure” than some of its competitors—a light touch occasionally fails to register a keypress. It also sounds like there’s a hollow space under the keyboard, so instead of a normal “click” or “tap,” typing sounds a bit like tapping the surface of a drum. The Chuwi’s keyboard is serviceable, though, the offset trackpad and drum-like keys might be offputting to some users. But dear god, that touchpad. Both of the Chuwi products I’ve tested include Chuwi’s hypersensitive touch sensors, which tend to interpret a one-finger click as a two-finger gesture to switch between applications. Chuwi’s dialed down the sensitivity from the HiBook touchpad, which seemed possessed. Now, incorrectly interpreting gestures merely happens often enough to be annoying. You’ll still need a considerable amount of pressure to actually click the touchpad, too, which is located directly underneath the space bar, slightly offset to the left. For me, that’s been the deal-breaker with Chuwi products. 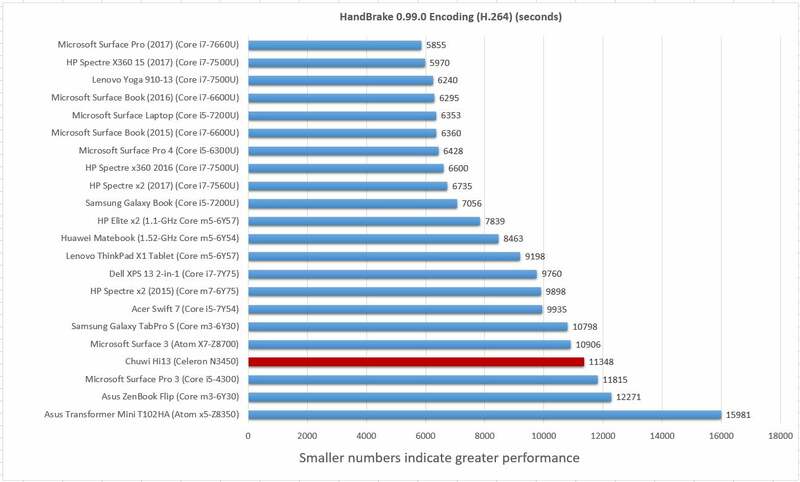 Performance-wise, you can find ways to work around the Hi13’s limicapabilities. But interacting with it on a daily basis can be simply painful. Even an external mouse doesn’t quite solve the problem, as a carelessly drooping finger can trigger the gesture that switches between open apps. Chuwi doesn’t include a pen with the Hi13, though you can purchase one separately. 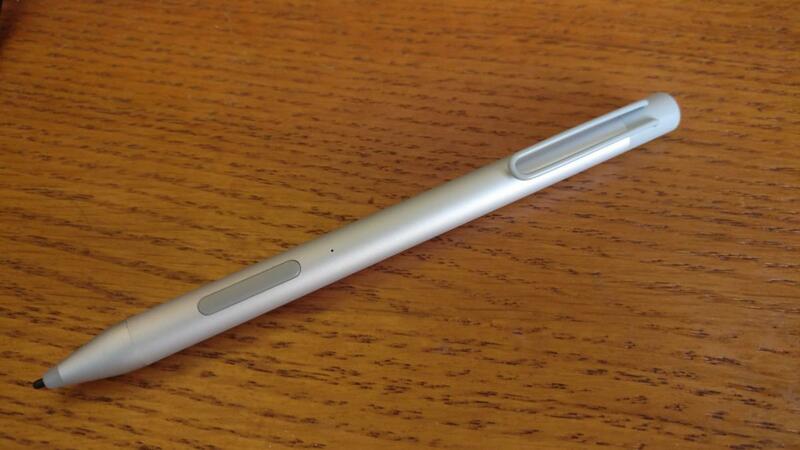 The Active Stylus Pen is rated at 1,024 levels of pressure (compared to the Surface Book’s 4,096), and it includes a AAAA battery. Though I’m not an habitual pen user, the pen was comfortable to hold, and demonstrated smoothly widening ink strokes as I pressed harder upon the screen—all I could ask of it, really. Chuwi’s optional pen ins’t necesssary, though it was comfortable and functional. Unfortunately, the Hi13’s Atom-based Celeron processor doesn’t allow for a lot of wiggle room in our benchmarks. As a device used for web browsing or basic Office work, the Hi13 is satisfactory. But any time the Hi13 “multitasks,” you risk a slowdown. Case in point: I turned off the Hi13 for several weeks. When I turned it on again, Windows Update kicked off, very slowly feeding several updates over the course of four hours, even over ethernet. That process alone consumed 60 percent of the CPU, and opening a single Edge tab gobbled up the rest of it. To be fair, I didn’t notice any stuttering or other hitches, though an embedded video was slow to load. As I opened other tabs, though, pages weren’t quite as responsive, though that may have been due to the wonky trackpad as much as the system itself. Still, I successfully played back 4K videos on YouTube and watched a few Nextflix videos, and edited and resized photos. Here, I noticed no slowdowns at all. Keep in mind, though: With other machines, everyday tasks like virus scans, file backups and other background activities never really impact your daily usage. With a device like the Hi13, they do. You’ll notice that in our test suite of basic home and office tasks, which include PCMark’s Work and Home metrics, the Hi13 finishes well down on the list. The Work test measures tasks like word processing, video chat, and spreadsheets. But the Home test adds light gaming and photo manipulation, typical tasks that also start to show off the Hi13’s Surface-style display. 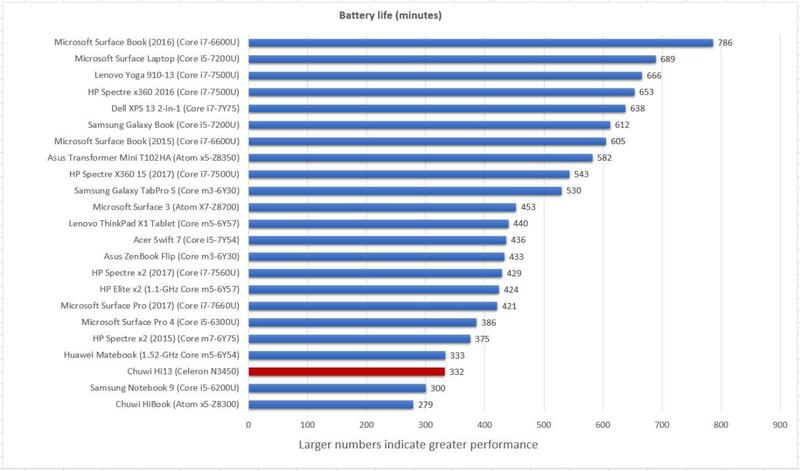 And that’s where Chuwi’s Hi13 tablet starts to struggle, as you can see in the charts below (in red). With the Creative benchmark, the list of tasks shifts to photo and video editing as well as video transcoding. 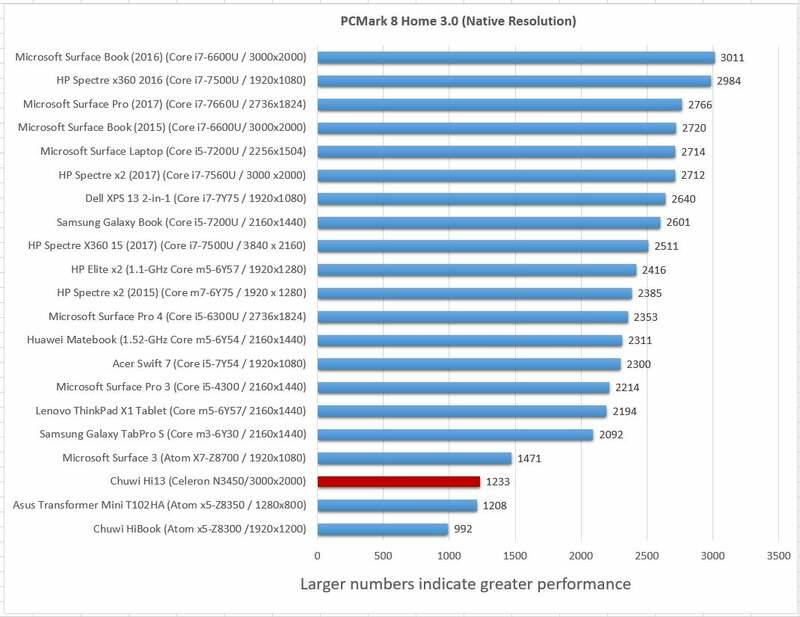 Again, the Chuwi Hi13 finishes way down the list. 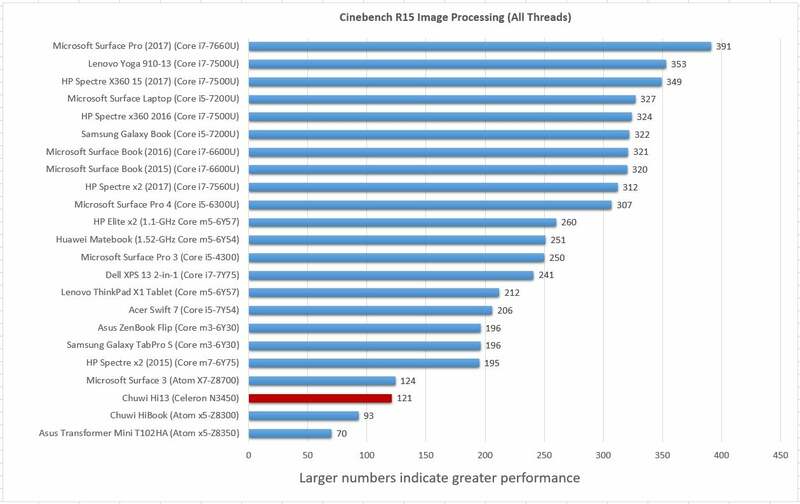 With Maxon’s Cinebench benchmark, we begin to stress all four cores of the Atom CPU, asking each to help render part of a computer-generated 2D scene. Again, you’d expect to be using the Hi13’s screen to best effect here, but the processor simply can’t keep up. Ditto for the open-source Handbrake benchmark, which takes a movie encoded in an MKV format, and transcodes it to a lower resolution for use with an Android tablet. Put another way, it took almost three hours to convert a 90-minute movie, when rival tablets and notebooks did it much faster. This isn’t just an abstract benchmark, but wasted time, too. 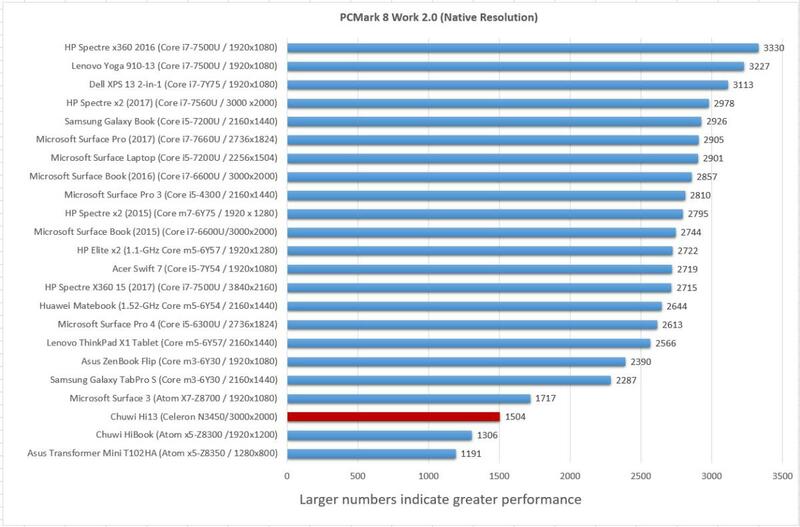 Really, there’s not much point in playing true 3D games on a machine like the Hi13, though we tested it using the 3DMark Fire Strike benchmark. Chuwi’s correct in claiming that the Hi13 can play games like the free MOBA game League of Legends and DOTA 2; the Hi13 ran those games just fine. Beyond that, however, you’ll probably find the tablet’s performance will bring most modern games to a standstill. Finally, there’s battery life. It’s here that the distinctions between the Hi13 and the Surface Book become sharpest. With batteries both in the tablet and the base, the Surface Book’s battery truly can last all day. The Hi13's 37Whr battry lasted just over 5.5 hours in our tests, so you’ll need to carry the AC adapter with you on longer jaunts. When I reviewed the $250 Chuwi 10.1-inch HiBook last year, its sturdy construction and ability to dual-boot between Windows and Android partially redeemed it, in my eyes. Unfortunately, the Hi13 doesn’t follow suit. It’s a heavy, ungainly convertible notebook with neither the performance nor the battery life to justify lugging it around. Yes, it’s about $500, with a truly high-end display that you'd normally find on a device priced at hundreds more. Over time, though, I think its little annoyances will add up to a truly unpleasant experience. I can’t recommend it. Chuwi's latest 2-in-1 tablet tries hard to provide a cheap alternative to the Surface Book, but ungainly construction and poor performance do it in.